Olives are one of the most widely enjoyed foods across the globe. Olives are the fruits that come in a wide range of varieties. They are bitter in taste and are highly used in the preparation of salads. Olives are one of the healthiest foods that one can opt for. Even olive oil is known for its wide range of health and beauty benefits. Hence, all in all, this is one fruit that is packed with goodness for the body. The health benefits of olives are numerous. They help eliminate excess cholesterol in the blood, control blood pressure and are a good source of dietary fibres as an alternative for fruits and vegetables. Olives are the greatest sources of vitamin E. This vitamin acts as an antioxidant and protects the cells from free radical damage. Regular consumption of olives reduces the effect of degenerative diseases like Alzheimer’s and benign diseases. Olives prevent blood clots that can lead to further diseases. They also protect the cell membrane from cancer. Likewise, there are various benefits of consuming olives. 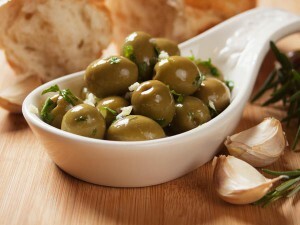 Therefore, in this article, we at Boldsky will be listing out some of benefits of consuming olives on a regular basis. Read on to know more about it. For Cardiovascular Health: Olives have a diverse range of antioxidants that protect the cells from oxidative stress. The antioxidants in them protect the cardiovascular health by neutralising free radicals. The monounsaturated fatty acids present in olives are good for reducing the risk of cardiac diseases. Cancer Prevention: Olives lower the risk of cancer by providing a rich supply of antioxidants and anti-inflammatory nutrients. They lower the risk of breast cancer and its re-occurrence. Weight Loss: Olives assist in weight loss too. Their monounsaturated fatty acids help in weight loss and weight management. According to a research conducted, a diet rich in olives is beneficial in reducing weight. Digestive Health: Maslinic acid and triterpenoid compound present in the olive skin help fight cancer cells. This acid hampers the growth of colon cancer cells. Since olives are a good source of fibre, they promote the digestion process. : Olives are a rich source of iron, an essential mineral component of haemoglobin. Haemoglobin carries oxygen from the lungs and transports it throughout the body.